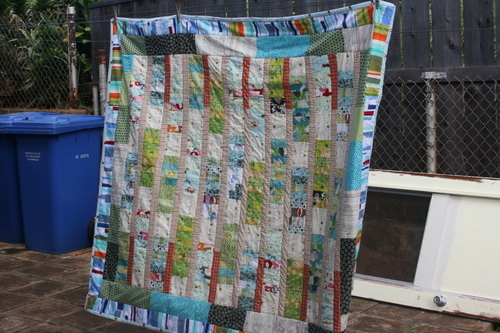 I finished son #3's quilt last night. I love the feeling that comes with finishing a project! 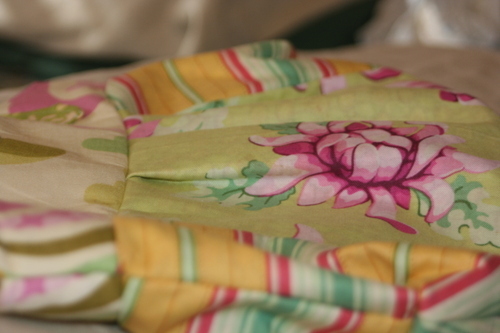 I finally got the slip-stitch mastered the last few inches of the quilt! At least I'll be ready for my next binding. Here's some pictures..I know they aren't great. But I wanted to post some even if they are a little dark. I just stitched in the ditch...no free-form. I really want to try this technique out next. It looks like it might be faster but with my sewing, it'll probably take me a lot longer. He was already asleep when I finished so I just laid it on him and this morning he woke up to his new quilt. And of course - which I knew was going to happen- he loves the back more than the front since it has the cool rocket fabric on it. 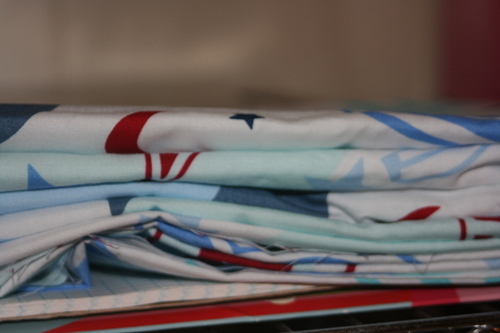 Ok so I haven't actually done any sewing yet...but I have cut some things out. 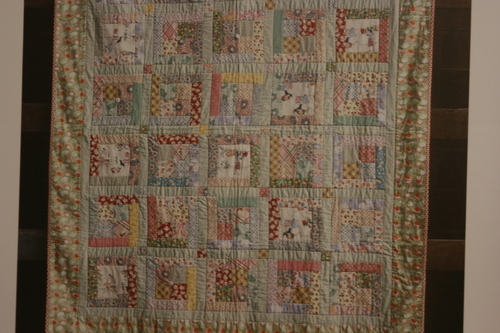 I want to make quilts for my girls...not matching exactly but similar. 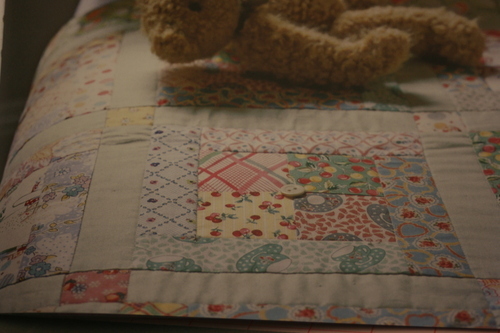 I have a really cute quilt book called "Quilts" that I picked up at Costco last year. 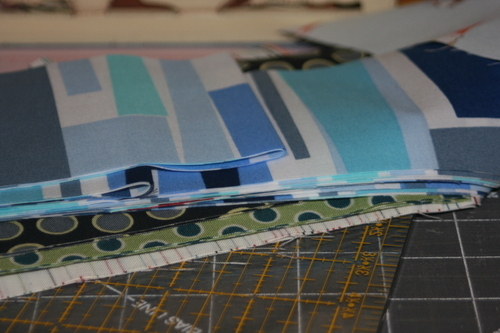 It has a quilt called "1930's scrap quilt" and so I've started cutting out the pieces. 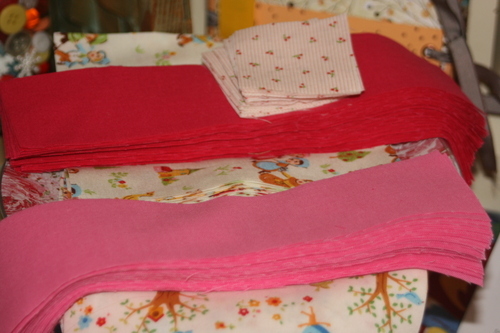 I'm going to use a pile of Freshcut quarters and scraps for all the scrapy parts and I have some beautiful Kona cotton in two shade of pink for the sashing. 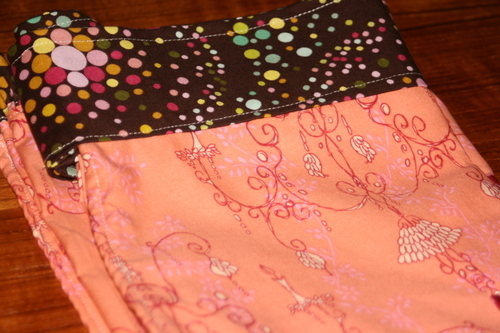 I'm also using some sweet Japanese import fabric from Superbuzzy for the bigger squares. I had to snap a picture of this bag (Sherbert pattern by Melly and Me) to enter a giveaway they are having on their blog. It was my first attempt at a bag (awhile ago)...it is quite wonky. They are so creative - I know I have said this before but it is so true. So I made these this morning...they are very good. 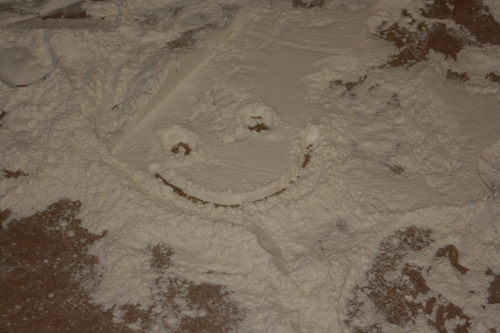 Even the batter was yummy (almost dough-like). And now I have potato gratin bubbling away in the oven. So I had to post this...my grandmother called up a few hours ago to tell us my grandfather had been hit by a car!! He's 80-something years old!! They live in a tiny town in Tenn. and I guess he was parked along the road in town and was going to get in his car when someone came whizzing by and hit him. Knocked him to the ground. The lady got out and told him he had walked into her car!! He said she told him her name but he didn't hear her since he's hard of hearing (pretty much deaf in one ear). He told her his name and that was it. She just left! I'm sure he insisted he was fine but still...he's an old man! And instead of going to the hospital, he went to the library and returned the movies they had rented and then went home. He said he has a big bruise on his hip and his shoulder is sore but he can move his arm all around so he's sure it's not broken. He's pretty stubborn...can you tell?! We have all been worried about him since he's getting older and just not in the best health (he had to be hospitalized before Christmas for an irregular heartbeat) but I guess we shouldn't be - he's pretty tough! I wrote him a letter a few weeks ago just letting him know how I feel about him so I wouldn't ever think.... "I wish I had told him how much I love him but I just never got around to it". Guess we'll see how he's feeling tomorrow - oh and my grandma just thought how awful it must've been for the poor lady who hit my grandpa!! What a pair! So I tried to do some sewing yesterday and not feel too sad. And I don't know how, but I picked the crappiest movies to watch when you are feeling sad. They were good movies, just not feel-better movies. But now I can send them back to Netflix, after actually having watched them, which hasn't been happening lately. I really need to snap out of this funk...I wonder if baking would do the trick. Baking and some fun sewing with feel-good movies. But none with Heath because they would make me sad..poor guy. And I don't know why I feel so sad for him when this happened last week here and it didn't affect me like this. And this horrible tragedy too.....but that one struck closer to home since I have a 2 year old too. OK I have got to get moving and shake this off. 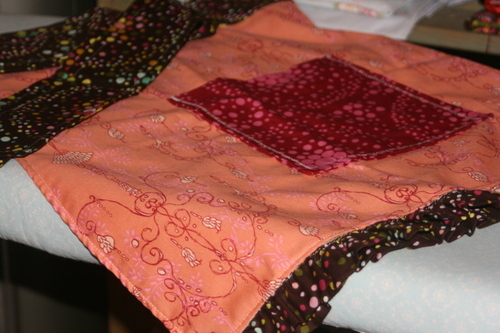 Here's what I was sewing yesterday...an apron for a friend's birthday on Sunday. I also picked up this book for her. It doesn't get any better than that...unless maybe you have a maid to do the cleaning. But I don't. But I did spend the day cleaning all my windows and screens. I love looking outside through clean screens. I had to replace some since they were really old and hole-y. I also washed the filthy car. Then he came home and put in a new back door. Now I need to paint it...decisions, decisions. No sewing today but I did make some sushi and won tons and then was feeling the need for something sweet. I think it's from reading this blog - I am working my way through it. I had some mascarpone cheese in the fridge and found this delicious recipe. I know it sounds a bit odd but it was DELICIOUS!! This horrible event is all over the news here in Hawaii. I can't even imagine how this mother is surviving. I only pray she is surrounded by people who love her and will comfort her in what must be the worst thing that has ever happened in her life. I can't imagine what kind of person would do something like this...but I know the world is full of them. Sorry for being so dark but it has just made me realize how much we need Jesus in this world. The little boy is the same age as my baby girl. I think I will be holding them all a little closer in the coming days. OK...I am just..I don't know...I don't even have the words to describe how I feel. Utterly happy, inspired, hungry (definitely). Let me start by saying I have quite a blog roll going on. 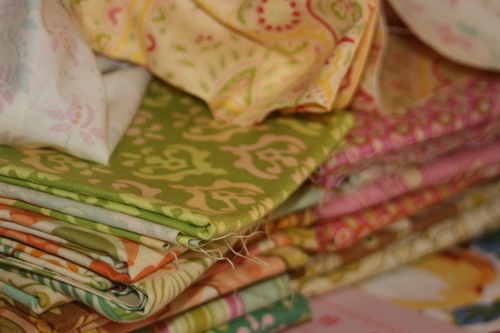 I keep finding new blogs to add to it and most of them (in fact, almost all) are craft-related. So today as I was reading My Paper Crane's blog, I saw she had added a link to a recipe that looked yummy so I clicked on it...and am now in the process of reading my way through 3 years of the most wonderful blog ever. I just don't have any other words for it. It's like reading a hilarious, clever, delicious book in blog form. 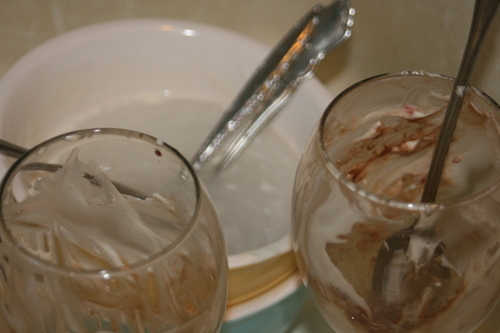 So anyway, during this wonderful discovery, a not-so-wonderful thing was happening in my kitchen. And it is my fault for leaving a two-year old unattended. Yep, flour, flour everywhere! At least 10 cups. I'm sure she was having a marvelous time..running her hands through the soft, white flour. She had it all over herself. And was very content until I discovered her, at which point she burst into tears. Poor little thing. So off to the shower she went and into the kitchen I went to clean it up. It was really no big deal (although I did decide I needed to wash out the vacuum out after) and I got it cleaned up rather quickly. No, she is not crying in this picture because I yelled at her - she wants me to put her pants on (yep, she went straight down for a nap after this). 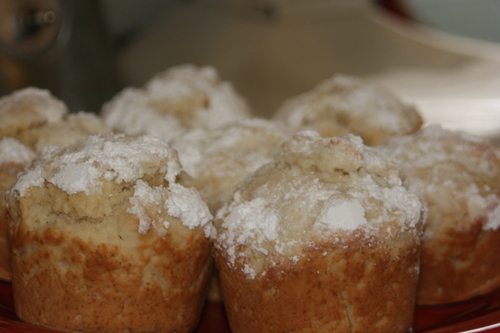 So...guess maybe all this food drama related today...kitchen full of flour...most wonderful food blog ever!! Speaking of food....can't wait for the new season!! 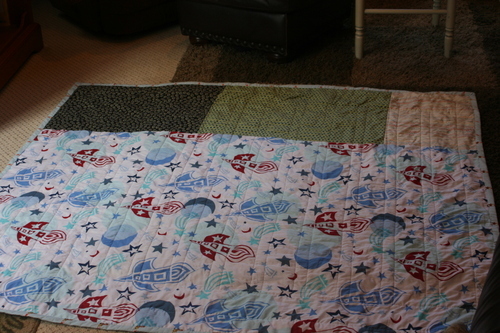 So....I am working on finishing #3's quilt. 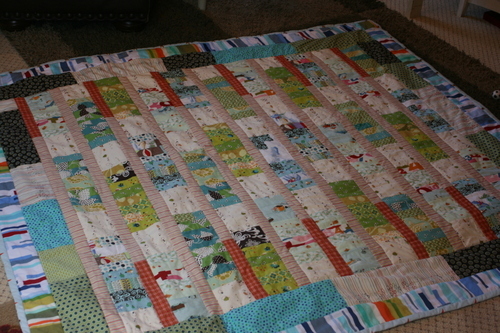 But Hubby thought it was a little short (which it was) so I decided to add a couple rows of borders. I didn't use a pattern - just picked out some fabrics and made it up as I went along. 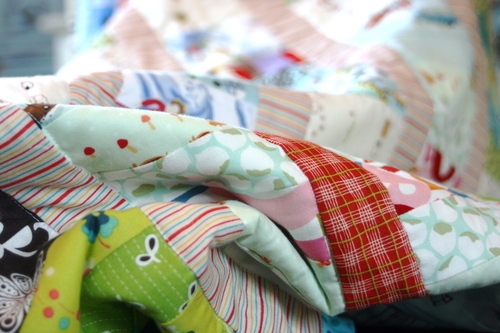 Now it is turning into the "quilt of many colors". Here's the fabric for the borders...they are already sewn on...while watching Project Runway - I can't believe Kit got eliminated! 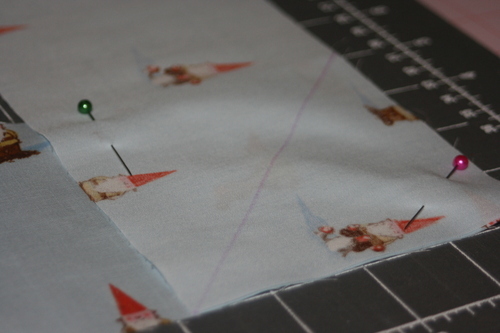 I made the binding with this wonderful gnome fabric - I just love it. 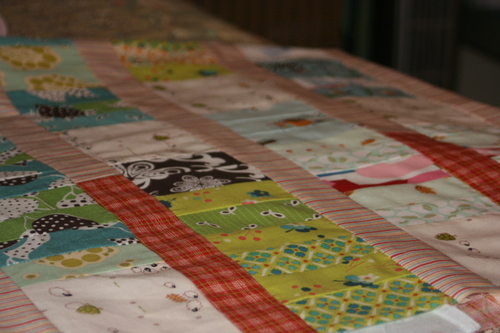 I think I cut it a little wide but oh well - it can just be a wide binding. I made sure I did it right too...even used a ruler and pen since I'm horrible at those 45 degree angles! So now it has two borders around it and is just waiting for batting and the back...I have this fabric for the back along with I don't know something else. 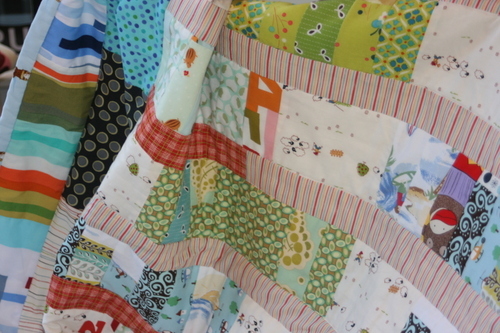 Oh, and this has nothing to do with quilts....but have you seen the previews for this movie?...and all the hype too! Man, J.J. Abrams is building up quite a back story on this one!! It was cold today..probably low 70's:-) . I know that's nothing to most people but we were all really cold today. So our eldest has decided he likes baking..poor guy - I've denied him for so long because I didn't want to clean up the mess and finally realized that was horrible of me. 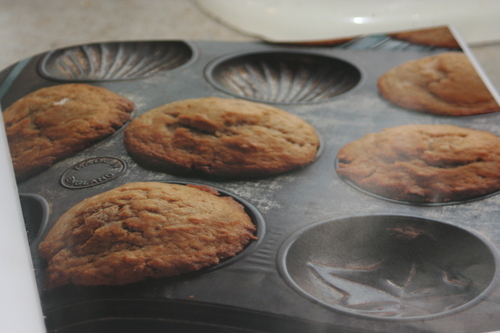 So, the other day he made chocolate chip cookies and today it was spice muffins. They are so yummy and really easy to make. He did real good and only had one mishap. 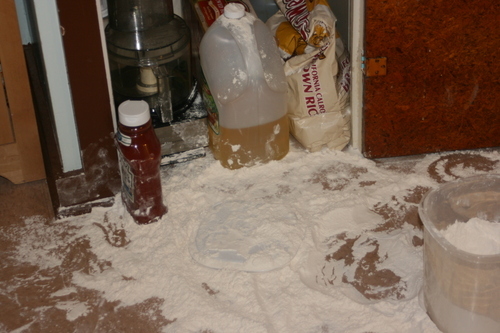 His other siblings were watching a movie and I guess he got a little side-tracked, only problem was he had left a big container of flour on the table (within little arm's reach). 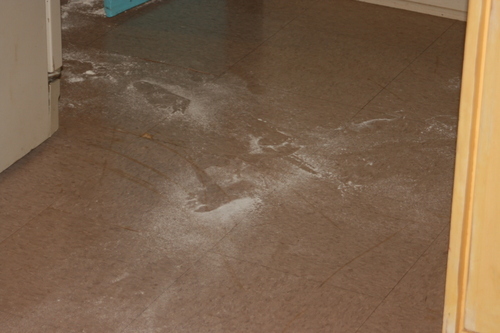 So, I walked in to find our two-year old covered in flour, with flour all over the table and chair. It actually cleaned up pretty fast. 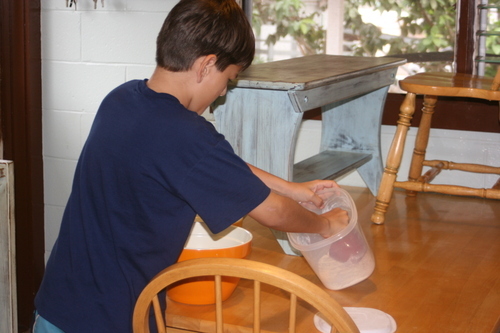 He has to wash his own baking dishes as well but usually has to do them twice since he doesn't realize they aren't supposed to be all greasy when they are clean. But he is really enjoying his new-found freedom and I feel like a horrible mother for making him wait so long. I love having a clean house (and I've actually gotten less o.c.d. 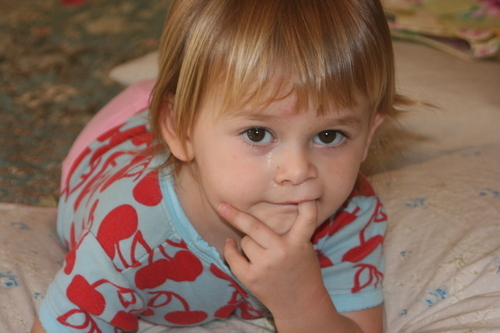 about it) but I would much rather have happy children who are expressing themselves doing something they love. I dyed/cut my hair recently (before Christmas) so here's a pic of the new do...sorta. 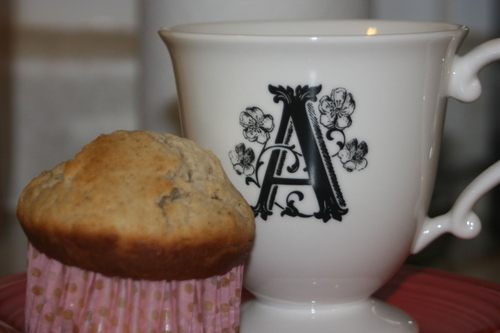 And here's the yummy Spice Muffin recipe - Enjoy! Preheat oven to 400 F. Grease 12 cup muffin pan. Basically you mix all the dry ingredients in one bowl and the wet in another and then mix together. Spoon into prepared pan and bake for 20 minutes. Barefoot boy, with cheek of tan! 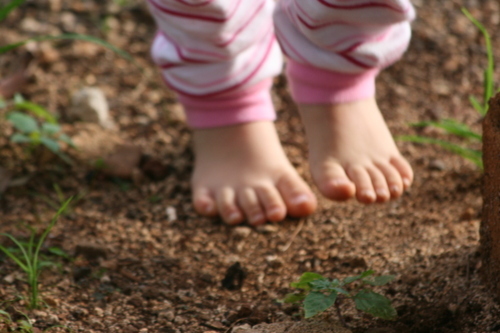 I was once a barefoot boy! Blessings on thee, barefoot boy! Of the gray hornet artisans! Blessings on the barefoot boy! It just evokes up such lovely imagery, doesn't it?